Apply now for ROCK the MIC USA and rock San Francisco & New York City with TSS! 12 awesome teams will be chosen to join the Taiwanese Pavilion at TechCrunch Disrupt SF 2016, then fly with us to New York to meet our partners NYC Media Lab and more! Register now to pitch on July 22! Are you looking for Rock the Mic USA 2017? WINNERS WILL BE ANNOUNCED VIA FACEBOOK ON 8/1! Stay tuned! Are you ready to take on San Francisco AND New York? It's time to ROCK the MIC again, and this time we're bringing 12 Taiwan startups on a great American adventure! The selected teams will not only earn their place in the Taiwanese Pavilion at TechCrunch Disrupt in San Francisco, but will also fly to New York City to meet our partners at NYC Media Lab and more! 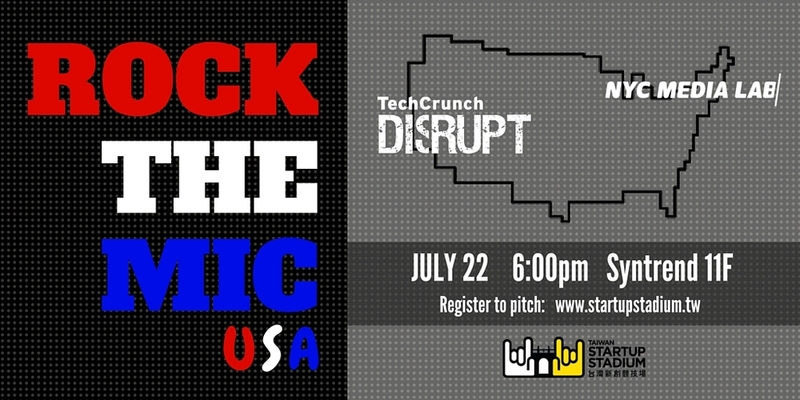 Register now to pitch on July 22 and get geared up to rock the USA! 2 minutes. No slides. No product demo. Give it a shot! Team must have at least a demoable working prototype (hardware) or public beta (software) by the July 22 pitch. Note: Product demos will not be permitted during the pitch, but TSS reserves the right to request a demo before making a final decision. Important note: Due to TechCrunch rules, winning teams must pass final approval by TechCrunch Disrupt staff, and meet the requirements listed above. If you're unsure whether your team qualifies, you can contact us with questions. Oh no! Our team won't be in Taiwan on July 22! Can we still register? We encourage all teams to pitch live, as our judges will be able to ask follow-up questions that may help us better understand your product. However, if none of your co-founders are available to pitch live on July 22, we can accept your pitch by video, following the same rules as the live pitch. Videos will be reviewed on July 22, but the teams will not be given the opportunity to answer questions.